Canada will face Switzerland in their 13-16 match up at the 2017 WSF Men's World Team Championship. Scheduled to hit the courts at 2:30pm local time, Team Canada will face 16th seed Switzerland, line up to be confirmed. A win will secure Canada a top 14 finish. Starting tomorrow (November 28), the Canadian squad will start their #oneteam journey in Marseille, France for seven days of International competition. 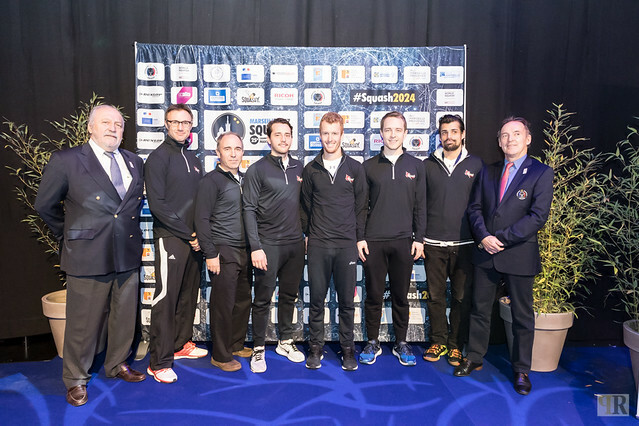 From November 27 to December 3, twenty-four teams from around the world will battle it out at the 2017 WSF Men's World Team Championship. Team Canada, comprised of Nick Sachvie, Andrew Schnell, Mike McCue & Shawn De Lierre, are seeded 14 in Pool C, along with competition from France and Ireland. Their first match of pool play will be against hosts and #3 seeded France on Tuesday November 28 at 7pm local (1pm EST) on the glass court. Canada will then play Ireland in their second pool play matchup on November 29 at 3:30pm local (9:30am EST).